It may be a while before we see WiFi enabled paints… but I just found out that two new patents have been issued to Color Kinetics Incorporated. U.S. patent number 6,717,376 is a utility patent covering Automotive Information Systems that, in part, relates to color-controllable automotive lighting systems. This includes the application of LEDs in color and dimmer-controlled systems used to customize the look and feel of a vehicle, as well as feedback-controlled lighting systems that tailor the lighting conditions based on information from sensors. For example, a driver could use this technology to customize the color and intensity of a car’s dashboard or instrument lighting, or to use sensor feedback to convey information, such as the car’s temperature, through color. U.S. patent number 6,720,745 is a utility patent covering a Data Delivery Track. 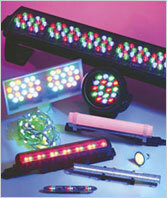 The patent relates to an LED lighting system where the lighting control signals are communicated through a light track. This facilitates designs and installations that call for intelligent LED illumination in a traditional track lighting scheme. The data used to control the LED-based lights on the track may be communicated through the track itself. If you can’t have true color changing paints, why not settle for the next best thing… color changing lights that can change the look and feel of the paint.